Pi’s family leaves India by boat for Canada. Their boat does not make it, and Pi is the lone human survivor. Some animals who were on board survive as well, but most die. This story shows Pi and a tiger named Richard Parker learning to co-exist on the open seas, although that might not really be what happened. Some of the feelings that Pi feels are relevant to many adoptees. Before his boat journey, Pi feels connected to many cultures. His family disapproves of this. For Pi, many of the cultures to which he feels connected are religious. For adoptees, the connections might be to religions, activities, languages, or a number of other aspects. As an adult, Pi appears to have crafted a satisfying blend of many cultures to call his own. When Pi’s family tells him that they must leave India, Pi expresses his displeasure at the idea. He wants to stay where he is. For children who entered foster care after toddlerhood, this might be very poignant. Pi feels very alone at times. He mourns the loss of his parents. He feels unsafe. All of these feelings may be familiar to children who have navigated the foster care system or other avenues to adoption. Like many children in the foster care system, when he is the most alone, Pi looks to God for strength. Pi is forced to do some things that go very much against his self-image, in order to survive. Some children have had similar experiences. Pi expresses, “even when God seemed to abandon me, he was watching. When I was beyond all hope, he gave me rest and a sign to continue.” This might provide hope to some kids and teens who feel desperate. *Spoiler* The tiger is symbolic of Pi's anger. He does not learn how to make it go away, but he learns, through much difficulty, to control it and live with it. There are quite a few traumatic scenes in this film which could be difficult for viewers who have been traumatized. A shipwreck kills many. A tiger devours a lamb off-screen. We see violence between animals, and are told about traumatic violence – including cannibalism – which happened off-screen. 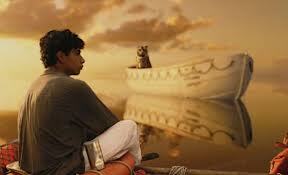 Life of Pi seems like a movie that a young child would like. 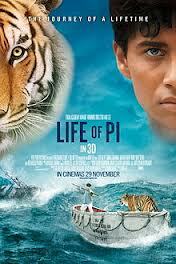 Trailers for the film seem to show a movie about a boy eventually developing a friendship with a tiger. But it’s not a kid’s movie. It might be a teen’s movie. On one level, it’s a story of survival in the face of loss, and against devastating odds. On another level, it’s the story of a man’s successful struggle to process horrible things that happened to him – and horrible things that he did – with the rest of his life. Pi thought that the tiger had human feelings, but was told that the feelings he thought the tiger had were only his own feelings. How do you think that happens? Does it ever happen with people? Pi’s father used a very dramatic and traumatic form of discipline to teach Pi to be careful around dangerous animals. Good intentions do not guarantee that a form of discipline will not be harmful. Do you know whether your child has ever been abused “as discipline?” How would you have handled the situation in the movie, in comparison with how Pi’s father handled it? 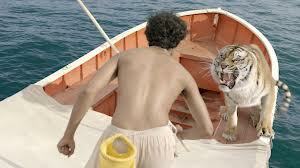 In one scene, the tiger gets on board the life raft, and Pi jumps off. If the tiger is symbolic of Pi’s rage emotions, that says a lot! Have you ever wanted to run away from your feelings? Name as many as you can of the feelings you’ve had this week. Which animal would represent each feeling, for you? Make a zoo collage. Which animals do you show to the public, and which ones do you keep hidden away?